This rustic winter scene show the land south of Metropolitan Avenue and east of today's 118th Street In Kew Gardens, NY decades before its open fields and woodland patches gave way to apartment complexes. These images did not appear in the original article. Click to enlarge. When the new line of the Long Island Railroad was completed, in 1910, between Manhattan and Jamaica, a new station, Kew Gardens, came into being and with it a quiet village of friendly front porches and tree-shaded dirt streets. On one of these front porches the idea for the first World's Fair was hatched. Today Kew Gardens is a hustling communications hub served by more than 100 trains a day in and out of Pennsylvania Station, the Independent Subway, two trolley lines and several bus lines. Queens County Borough Hall is here, built in 1940 for $1,800,000. In the beginning a family by the name of Bolmer purchased several pieces of property which became known as the Bolmer farms. Adjoining one of these farms was Crystal Lake, near which Kew Gardens Inn was later built, now known as the Kew Gardens General Hospital, and on the opposite corner, the Bolmer Apartment Houses were built, including a small restaurant and a tea room. Then, between 1878 and 1880 [Ed. 's Note: It actually happened 10 years earlier than that.] a wealthy Englishman, Albon Man, and his brother [Ed. 's Note: No brother is known to have been involved.] bought two more farms that extended to Union Turnpike. With the help of a noted landscape architect, Edward Richmond, he developed and leveled the land. In 1886 [Ed. 's Note: My information puts the date at 1895. ], a golf links, known eventually as the Richmond Hill Golf Course, was laid out. 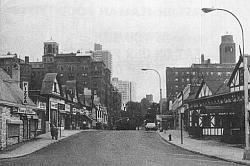 Hillside Avenue, now Park Lane, ran almost through the center of the course. After the Long Island Railroad Station was opened, the work of laying out streets, paving them and building began in 1912. [Ed. 's Note: Old maps show that there were new houses in Kew Gardens 5 years earlier than that.] Kew Gardens and its streets were named after English places and the streets ran alphabetically. What had once been a swamp became a park and its woods are now called Forest Park [Ed. 's Note: It was the area north of Queens Blvd. and not Forest Park that was the swamp. ], with driveways, bridle paths and playgrounds. During the early days, at Queens Boulevard and Union Turnpike, there was a swank establishment known as Hopsdale Hall [Ed. 's Note: The correct name was "Hopedale Hall."] and to this resort came prominent New Yorkers to enjoy its famous and nightly entertainment. By 1921 the Man brothers had built about 300 homes in English and Colonial styles at a cost of several million dollars. They were determined that Kew Gardens be unique, the most attractive New York suburb. The selection of the prospective homeowners was supervised by Kew Gardens Corporation in order to bring prominent and desirable people to the community. Each home owner eagerly awaited the coming of electricity as our streets were poorly lighted even though the little old lamplighter appeared every night with his long pole and torch to light the lamp posts. We had many needs and it was hard to put first things first, such as the urgency of a school for the children, a church, a Sunday school, and a community center. So it seems the first order of business was to form a civic committee to take up these needs in the order of their importance and a community center for our social and cultural needs. The various committees attended to the tasks assigned -- visits to the Board of Education, City Hall for land for the school, sewers and a better lighting system. We had many meetings for a church but it with such a small population it was difficult to raise the funds and support. Today we have a lovely little church on Kew Gardens Road and Lefferts avenue, built though the organization of the Dutch Reform Churches, although we had a Sunday school before this event took place. This was supported by the generosity of several of the men of the community who felt that the children needed spiritual instruction. The older children had to travel to Richmond Hill to the established school there. The other alternative was to travel via Long Island Railroad to Garden City (St. Mary's for the girls and St. Paul's for the boys) until the new proposed Kew Forest school was built. Later the little school house, PS 99 at Brevoort Street [Ed. 's Note: It was on Cuthbert Road. ], was replaced by a fine grade school and playground that now stands on Kew Gardens Road. Now that prime necessities were taken care of, our thoughts turned to a community center, built, in part, by the hard and ernest work of the women who raised money though card parties, cake sales and many other ventures. The men generously invested money in the Center's stocks and bonds. What a blessing it was to all when the Women's Auxiliary of the Kew Gardens Country Club turned out endless Red Cross work, helped during the flu epidemic with soup kitchens and layettes. The men also gave speeches and sold Liberty Bonds as this was the First World War period. The first U.S.O. held dances for the men in service every weekend. The Women's Auxiliary was responsible for cultural activities; we had many speakers on current events and organized a Delphian Society. There were fine tennis courts and skating rinks on the Country Club premises and always a good time was had by all. We grew little by little. We had a place that served as a post office, newstand, and a cubby hole for a police booth; a grocery store still does business on the same corner. A meat market, drugstore and even a beauty parlor with some of the original family [sic] still do business here today. When the Kew Gardens Country Club decided that the community center no longer was needed, the members branched out in another direction and its interest became purely social. They established the Queens Valley Golf Course, but this, too, was given up when more and more space was needed for homes. There are a few things to be said about the early family settlers. There was never a more kindly or humane group. This was evidence by the many small things they did. For instance, on a cold winter's day when the mailman rang the bell someone was sure to meet him with a hot cup of coffee or soup. Or if his wife was sick there was a "choice bit of something" for her and the family. And this courtesy extended to the snow removal man who, with his horse and sled-platform, cleared away the snow. On May 1, 1914, the Hart family moved from Rochester, N.Y., to Kew Gardens. We slected the typical English-style house on the southeast corner of Onslow Place and Austin Street where we are still living today, the only original residents living on this street from Kew Gardens Road to Metropolitan Avenue. We have had many prominent people reside in Kew Gardens. Wil [sic] Rogers and his family lived on the opposite corner. Will Rogers, Jr., Mary and Jimmie were my daughter Jeanne's play and schoolmates and were frequently joined by Paula and Carol Stone, daughters of the famous musical comedy star, Fred Stone, who all went to the New [sic] Forest School. Our front lawn was a community stage on which they did stunts and played games. A few of the prominent residents of Kew Gardens were Col. Frederick Waterbury, J. B. Vanderver, who was known as Father Knickerbocker of New York City; Gene Fowler, author; Hop Hadley, Charlie Chaplin's manager; Henry Bohack of the tea, coffee and restaurant business, and Mrs. Stanley Brown, President Garfield's daughter, who taught me how to make buttonholes. The idea for the first World's Fair of 1938 was hatched on the sun porch of John B. Burton, our next door neighbor, who was given Queens' Most Prominent Citizen Award. During World War I, most residents joined in holiday celebrations and dinners for the aviators and enlisted men from Camp Yaphank. The women did the cooking and the men did the carving and serving and there was always a large clean and gaily decorated garage available for dinner and the Kew Gardens Country Club for dancing. Many families, aside from the large group entertainment, made it a custom to entertain a few of the aviators in their homes every so often and we Harts followed this pattern. A most unusual joy and pleasure to the boys, strange as it may seem, was the privilege of taking baths. I can tell you we kept our water heater working overtime. Camp Yaphank was hastily put up and had just the meagher necessities so that baths were a luxury to them. After a home-cooked dinner, it was their pleasure to sit before an open fireplace, to sing, pop corn, roast apples and listen to tales of far away places from our brother George Overbury Hart. This gives a small picture of life when Kew Gardens was very young and beautiful.